Picard Of The Pops - Gerald Fried | Warped Factor - Words in the Key of Geek. Christopher Morley goes through Pon Farr! 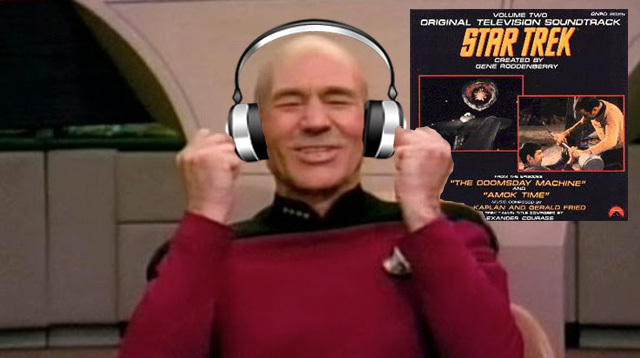 We come now to a man who gave Star Trek one of its most recognisable cues circa Amok Time - its fight music! Episode One of Season Two saw Gerald Fried given licence to run amok. Born in February 1928 in the Bronx area of New York, he studied at the Juilliard School of Music having attended the same high school as Stanley Kubrick. They would work together on five of his early films - Day Of The Fight, Fear And Desire, Killer's Kiss, The Killing and Paths Of Glory. "I was an oboe major at Juilliard, and I used to hang around Greenwich Village trying to pretend I was a smart intellectual, which I was not. One of the nerds down there saved his money and made a little 18-minute short film and said, “Gerry, you go to Juilliard. You know how to compose and conduct a film score?” I said, “Suuuuure! Nothing to it.”"
But he had to learn on the hop! "I had about two or three months to learn what the hell to do. I went to movies, sometimes two or three a day, because there was no class then that taught film composing. Anyway, somehow I managed to get through that first score. I conducted it. And, as a result, this nerd and I were offered jobs by RKO-Pathe, which was the news end of RKO in Hollywood." "Musically and emotionally, “The Rite of Spring” comes from the same sort of place that Gerald Fried’s music for “Amok Time” does: a primal ritual, violent and dangerous, brimming with emotions incapable of being tamed. There is an obvious thematic commonality, and I’m surprised more people don’t see the parallel. Stravinsky was enormously influential particularly on film composers. John Williams, James Horner and Jerry Goldsmith–each of whom have scored numerous space opera films, including Star Wars andStar Trek–all derive much of their musical styles from Stravinsky. In fact, you could argue that Stravinsky, breaking out of the conventions of 19th century classical music, invented the style of music without which movie scores would not be nearly the same." "Mild protests against the music could be heard from the beginning." "There's something that, finally, can't be explained away, something you should feel in your gut when you experience the piece. A century on, the truly shocking thing about The Rite is still with us, right there at its climax. A good performance will merely pulverise you. But a great one will make you feel that it's you – that it's all of us – being sacrificed by Stravinsky's spellbinding and savagely cruel music." Exactly the feeling of watching Spock get nasty as part of the Vulcan mating ritual of pon farr, you'd think? Gerald would give an interview to www.startrek.com in which he admitted to being more than a little surprised by the level of interest shown in his work! "I’m very shocked, but not altogether surprised. There were two shows that I did in television that had reverberations far beyond what you’d expect from the venue and the possibilities. One was Star Trek and the other was Roots." "There was an atmosphere, doing both shows, that these were a little special and certainly more important than most shows. So I’m not totally surprised, but the enormity of Star Trek is a little bit startling and wonderful. I love it." And his philosophy was simple - the music should enhance the show it was soundtracking. "You have to break it down to the component parts. Where should the music be? What should the music say? Should it go with the scene as it’s shown or should it get into some subtleties that are not visual? You have a car chase. OK, but what if the driver just found out this his mother died, and that’s what’s going through his mind during the chase? So, you make a series of those decisions and that gets you to what music should do." Even assigning Spock a specific instrument, the bass! "Spock had a lot of trouble with emotion. If he did have any, he hardly knew how to get it out. Now if you try to play a lyrical line on a big thumpy bass guitar, you're gonna have trouble sounding lyrical, so I thought it would be a match to write a lyrical theme but put it on the bass guitar. It somehow parallels Spock's trouble and confusion with emotion." And he doesn't even mind that Amok Time's music gets everywhere, having received royalties every time its used! "It shows up in my ASCAP statement. It was in The Cable Guy. It was in The Simpsons. It was in Caddyshack. It shows up in things I’ve never heard of sometimes. It shows up in unusual countries, like Bulgaria."